Amazing story by Joseph Mitchell, "Mr. Hunter's Grave" (1956), that covers among other things, edible wildflowers, strawberries grown on Staten Island, oysters raked from the Lower Bay of New York, and an ox roast ("or what they call a barbecue nowadays"). There was a walnut sideboard in the dining room, and it had been polished until it glinted. On it were two lemon-meringue pies, two coconut-custard pies, a pound cake, a marble cake, and a devil's food cake. "Four pies and four cakes, counting the one I just finished," Mr. Hunter called out. "I made them all this morning. I also got some corn muffins put away, to eat with the chicken fricassee. That ought to hold them." This week for Passover we made traditional Chicken Soup with Matzo Balls (aka Jewish penicillin). Two years ago, I posted a vegetarian version, and after seeing Mitchell Davis' four stockpots of soup going for his seder at the Beard House, I thought I would post my unfancy recipe. Yield: About 18 cups soup, or about 12-14 servings. Salt and pepper three pounds chicken (you can pretty much any part you want; there is a theory that backs, necks, and feet give the best flavor). Roast on high heat (~430-440 degrees) until it takes on color, about 30-40 minutes). Save skin and liquids (separately) if making gribenes and schmaltz. Add roasted chicken along with three carrots, two medium onions, and a stick of celery (all chopped) to stockpot along with enough water to cover. Salt and pepper conservatively (you will add more and adjust at the end). Bring the pot up to boil then down to a simmer. At the end of the two hours, adjust again with salt and pepper. Refrigerate soup overnight. The next day, skim the surface and remove chicken parts. Pass through sieve or cheesecloth if clear broth is desired. Bring the soup back up to a low simmer. Taste again for salt/pepper. Thirty minutes prior to serving, add cooked matzo balls, deboned soup chicken, and fresh herbs if desired (dill, parsley). Our next pop-up restaurant goes off Saturday, April, 13. At the center of the menu is kubbeh, a filled semolina dumpling served in soup. Part of the inspiration for the project originated when I listened to Mitchell Davis' interview with Naama Shefi. Shefi has just completed a three-week pop-up in New York centered around kubbeh called "The Kubbeh Project". Kubbeh also appears in Ottolenghi's "Jerusalem", so the dish seemed like a natural, if not essential fit. Thanks to all who made Pi(e) Day a raging success on 3.14! I think everyone had a mellow time and the strong finish by Clinton D. to win the pie-eating contest left us feeling we had witnessed a veritable spectacle. By my count, there were about 21 pies eaten by ~60 people. Our pie-baking contestants: Claire H., Shannon H., Lauren H. (champ), Briana B., and Stephanie T.
Our pie-eating contestants: Jim, Jeremy R., Clinton D. (champ), and Marcus J. Our crew: Chef Matt, Val, Andy. Next year: We are already looking forward to next year, wherein we will hopefully have a Pi-digit-memorization-recitation contest to accompany the pie-eating and pie-baking. The product: This week we had BBQ Tofu Savory Vegan Hand Pies, Jamaican Savory Vegan Hand Pies, Chocolate Chip Mandelbrot, Pecan Pie Tartlets, and Lentil Soup. Our amazing customers and friends: Lauren H., EC&MC&SMG, Stan, Heather C et al., Allen &Marybeth, Horst, Nate&Amanda. Mad shouts to the crew: Claire, SZ, Val, Andy, Chef Matt, Jaime&Jay. Smoothie People: We had a very fine smoothie (Mango-Pineapple-Banana) from a couple (Dominique and Quincy) that set up on Foster Street with a generator connected to a blender. Exactly what I needed to keep to the morning moving! This week: With Passover on the way (next Monday the 25th), our olive oil Matzos will be for sale this weekend! The Product: This week we had an assortment of sweet and savory vegan hand pies (including Caramelized Banana), Chocolate Chip Mandelbrot, and Roasted Veggie Soup. Our amazing customers and friends: AS, Allen&Marybeth, Horst, Sherry, Shayna, EC&SMG, LG&JD, Lisa, Alison&Kelly, Leah. I just noticed that we are up to 555 likes on Facebook. Did you know the Washington Monument is 555 ft tall? Da Crew: As usual, I am awed by the dedication and dependability of our crew: Val, Andy, Chef Matt, Sara&Jeff. Happenings: Monuts' store opened! I dropped by on Sunday and the donuts (Apple Cider, Chocolate Chai, Red Velvet, Apple Pie a la mode) were delightful. Big ups to owners Mo and Rob. This week: Pi(e) day on Thursday. Please RSVP! Without any indication that this might be coming and for reasons unbeknownst to me, apparently the South Durham Market has selected a new vendor with a more locally sourced product to replace Berenbaum's for the coming season. I can't tell you how disappointed I am in their decision and how surprised I was to receive this generic form letter (below) disinviting me from the market. I can't say that I've ever heard of a vendor being voted out of a Farmer's Market. I had not received any negative criticism from anyone at market, and my understanding was that the re-application process to the market was more or less a formality. When I had to tell our customers Saturday that this was our last day at market, they were incredulous that the Board would do such a thing to an existing vendor. Why would the Board have let us in for nine months only to kick us out? As with the Durham Central Market, I'm also disappointed in the lack of feedback regarding the admissions process and criteria. Thank you for your interest in the South Durham Farmers’ Market. This year we were very excited to have such a large, respected pool of farmers and vendors to draw from. Unfortunately, your business was not selected for the 2013 – 2014 market season. Our organizational mission requires that the market reevaluate our market space and product diversity each year, so that we can provide as many opportunities for new and undermarketed farmers to sell their products as possible. As such, we encourage you to continue to consider the South DurhamFarmers’ Market next year as well, as a space for you product offerings may become available at that time. We strongly encourage you to apply next year with a more locally-focused product offering. Those applicants who provided a self-addressed stamped envelope will have their membership fee checks returned; all other checks will be destroyed. Those who submitted their membership fees via PayPal will have their fees refunded via PayPal within the next 10 days. 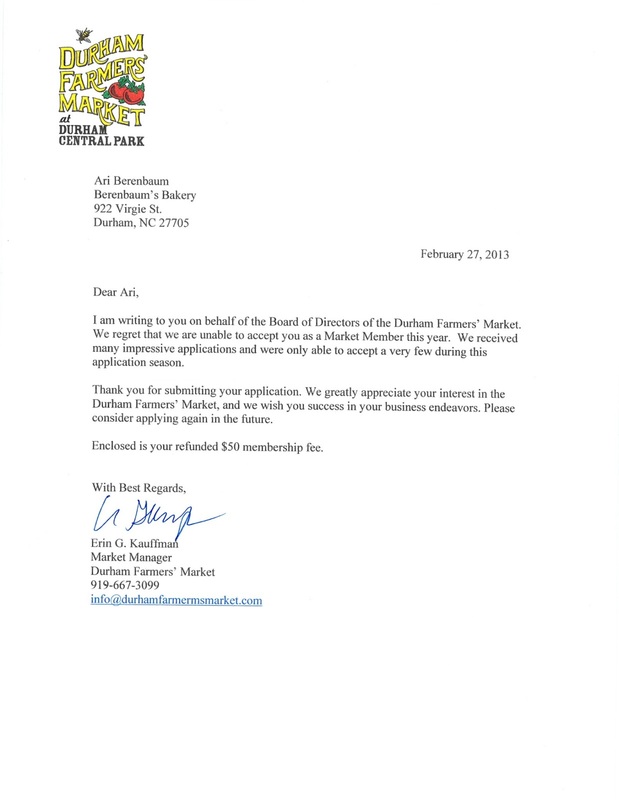 Again, thank you for applying to the South Durham Farmer’s Market. We are looking forward to collaborating in the future with Sarah Haggerty from Elementals, Stanley Hughes from Pine Knot Farms, and Ryan Butler from Green Button Farms. I would like to give an extra shout-out to Stu Z. (aka SZ) who has been selling for us at South Durham almost every week since it opened. Because Stu lives only 5 minutes away from that market, this feels like an especially heavy loss/insult for him. Stu, we appreciate all your hard work and dedication to the market. 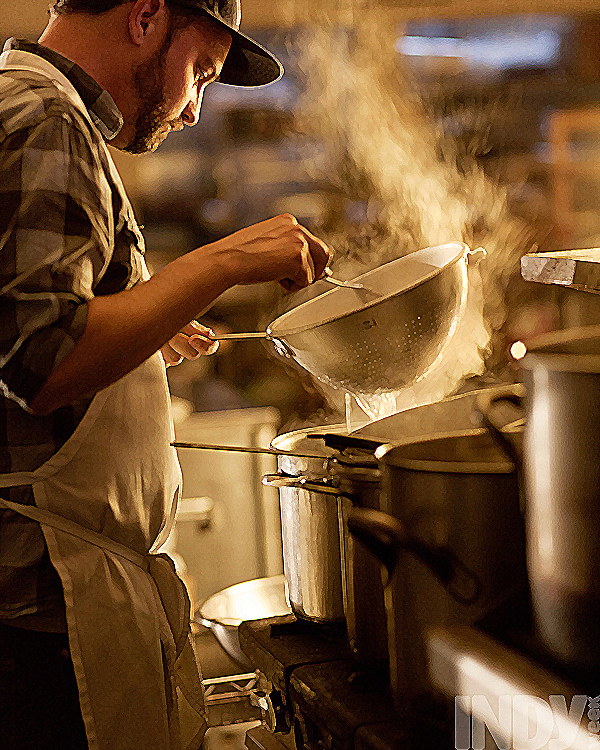 Stu will no doubt continue to work with the Berenbaum's team both in the kitchen and at the Hunt Street Market. So in conclusion, thanks to all our customers who came out and supported us at the South Durham Market. I am sorry we will no longer be able to supply you with vegan hand pies and other fine baked goods. If you would like to register a complaint with the Market as to our dismissal, I would recommend emailing Ben Filippo at manager@southdurhamfarmersmarket.org and cc'ing Board Chair and organizing member Kat Spann (Prodigal Farm) at kathryn6668@yahoo.com. I would like to express my disappointment in your non-renewal of Berenbaum's Bakery at the South Durham Market for the 2013 season. Handmade high quality baked goods are a rare treat, and Berenbaum's vegan hand pies and other baked products are all top-notch. I would be more likely to patronize your market in the future if I knew his bakestand would be reinstated there for the coming season. The product: This week, we had Spiced Irish Soda Bread, Sweet and Sour Tofu Savory Vegan Hand Pies, Pumpkin Chai Sweet Vegan Hand Pies, Lentil Soup, and Ramen Broth. Our amazing friends and patrons: Kevin&Heather, Sara&Jeff, Anna C., Shayna, Susan R, Andy and Annie and Miriam, Linda&Ben&Walter&Alice, Anna C., Marybeth and Allen, AS, Stan, Chris&Kate, EC, Sara&Jeff, Dan. Claire with giveaway winner Anna C.
Da Crew: Many thanks as always to our amazing crew: Val, Andy, SZ, Cheff Matt, Jaime&Nancy, Claire. This week: Mandel Bread (Mandelbrot) is back!